The W60P Package is a bundle of W60B base and W56H handset, which delivers top-tier audio clarity and battery durability. The W60P Package is an ideal DECT phone solution for on-the-go communication. The Yealink DECT IP Phone W60P Package enhances communication productivity for on-the-move employees in industries such as warehousing, catering, and retail as well as in factory settings. Small yet powerful, the DECT base W60B has upgraded hardware for powerful features, reliability, and scalability. 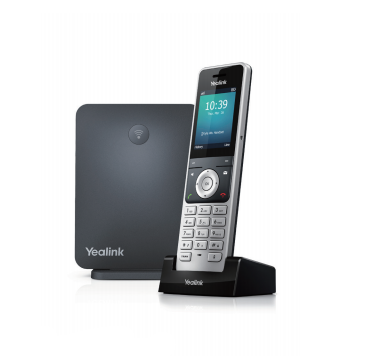 The Yealink W60B is the DECT IP base station is designed for small and medium-sized businesses. Pairing with up to a total of 8 Yealink W56H DECT handsets, W60B allows you to enjoy superb mobility and efficient flexibility immediately while eliminating the need for any additional wiring labor and expenses. A powerful chip ensures a better and higher performance. This DECT IP base station not only supports up to 8 VoIP accounts and 8 concurrent calls. but it also provides a fast startup and signal connection and minimizes upgrade downtime as well. With an advanced Li-ion battery, the W60P Package boasts 30 hours of talk time and 16 days (400 hours) of standby time. This DECT phone gives businesses a worry-free solution thanks to its quick-charge technology and robust battery. Upgraded hardware for the W60B translates into greater capability and improved stability. The W60B supports advanced codecs such as Opus and the AMR Codec. The Yealink W60 Package protects your investment returns, meeting current and future requirements.